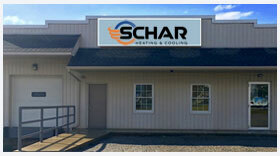 When you have an emergency, you can rest assured Schar Heating & Cooling, Inc....WILL BE THERE! Our commitment to program customers means we can have a technician to your door within 24 hours of calling our office. With most service companies, you can expect to pay regular overtime charges for after hour's service. Our program customers are offered discounted prices when they have a service problem.